The current first-generation iPad features a 1024×768 screen resolution display. MacRumors is now reporting that Apple is likely going to double that resolution for the next-gen iPad 2, taking it to 2048×1536 screen resolution. This report is based on the finding of developer @StroughtonSmith and @Xuzz on Twitter, who found higher resolution images, accidently left behind by Apple developers in version 1.1 and 1.2 of iBooks for iPad. Version 1.1 of Apple’s iBooks application seems to have accidentally included some artwork for this hypothetical pixel-doubled iPad. 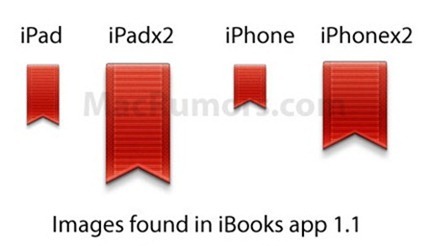 As shown above, the App’s bookmark icon included versions for the iPad, the iPhone and the iPhone Retina Display (iPhonex2). 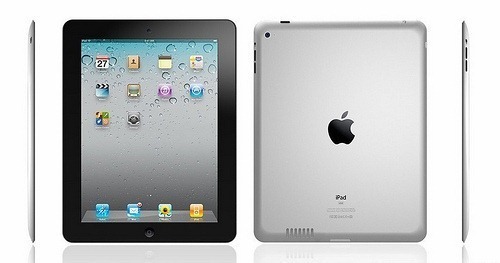 It, however, also included one additional version labeled "iPadx2". Sure enough, this is exactly double the resolution version of the iPad icon and is distinct from the other versions. The most likely explanation for this added graphic is plans for a double-resolution iPad. Apple has since removed this extra artwork in subsequent versions of iBooks. Based on this information, and persistent rumors of a higher resolution iPad 2, we believe the next iPad will have a 2048×1536 screen resolution. It would also explain why Apple would have to upgrade the GPU on the new devices to drive this higher resolution. If you recall, Apple did the same with iPhone 4 last year, by doubling the screen resolution to 960×640.